Cheerful Charles is back with his latest offering on Somerset a novel which describes, in his usual enthusiastic style, some of the fortunes of Somerset CCC in the late 1970s and the Belters of Snickworthy. Somerset's first Golden Age at that time with larger-than-life names such as Botham, Richards, Garner coupled with Vic Marks, Dasher Denning etc was gaining impetus and soon to be, for the next few years, a formidable county side but it is fair to say that the Belters of Snickworthy, with the likes of Keen Kev Furet, were not quite in the same league. I am delighted to see that little has changed with Charles's style of writing. He is still being disowned by the publishers, Halsgrove, and the very first page of writing disclaims his views once again. I know equally that he is still very much one of their favourites. During a previous review of one of Charles's books, I did feel that Charles had a rather good life: having worked in Libya, Hong Kong and been in the legal profession, he now ekes out a rather easier and presumably nice existence in the West Country. I remain envious. Bats & Belters is, like all of Charles's books, fun. Okay, some of us may learn a few new phrases and words - usually polite ones, I hasten to add! - from the depths of the West Country but, as an excuse, having spent around twelve years of my early life in the same general area, I will use being more Devonian as my reason. Zum was a different place even though I spent a few years on its border. The West Country is mercifully a different and more tranquil place and Charles conveys this very well in this enjoyable novel. 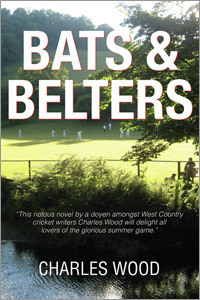 Bats & Belters takes us humorously through life in a small Somerset village and, in the process, a few skeletons tumble out of the cupboard and to some unlikely people. Gossip and rumours abound and the Belters must beat rivals the Pitchforkers for the village pig to be kept in the village. It's tight, nail-bitingly tight, a tortoise loses its life after a ball flies out of the ground but, sorry, you will have to read the book to find out whether the pig stays or goes. I am impressed that, in some of the Somerset matches mentioned in the book, Charles has diligently either had his Wisden or Somerset CCC Yearbook out and at the ready and all details are extremely accurate. It brings back many happy memories to me - well, maybe not Brian Rose's infamous declaration - as I am sure it will to many West Country fans. Whether the exploits of the Belters of Snickworthy, a motley crowd of hapless eccentrics, will remain as well-known as Somerset of the late 70s is doubtful but Charles's refreshing style will doubtless be enjoyed by many once again.